Alegria is a brand new 2 bedroom 2 bath condo for rent located in the most gorgeous condominium complex just two minutes walk from the best beach in Puerto Vallarta. A precious few low rise buildings nestled in a large tranquil garden setting with stunning views of the Pacific Ocean, Sierra Madre Mountains, Banderas Bay, and PV make up this quiet secure retreat just steps from great restaurants, shopping, convenience services, and entertainment. Zero entry HEATED pool with infinity edge and spa, large brick paved pool deck with fully equipped workout room, large furnished shaded palapa area, comfortable lounge chairs, designated secure parking spot, and magnificent landscaped grounds complete this treasure. Alegria itself is beautifully appointed throughout in a casual elegant Mexican style with custom touches, high end appointments, and numerous upgrades. Comfortable seating, custom made American sized pillow-top mattresses, luxury linens, a fully equipped granite and stainless kitchen, and two balconies plus a large private outdoor patio with gas grill are only some of the amenities provided. Alegria is over 1750 square feet of private indoor and outdoor space for you to experience your own individual joy. 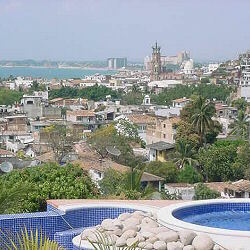 Located in the charming Old Town, Zona Romantica, area of Puerto Vallarta where a micro-climate provides cool breezes off the ocean and mountains, this tiny neighborhood of Puerto Vallarta has near perfect weather in contrast to the hotel zone, marina, and Nuevo Vallarta areas which are often 10 degrees hotter. Here the high season months are dry, warm, and sunny with breezy cool nights. We love this part of town where the cobbled streets and natural beach are alive with people having a great time all day and into the night. Here you can swim in the magnificent heated pool; play in the sand; go parasailing or rent a jetski; visit the new Los Muertos Pier; go to sunset cocktail hour in bare feet on the beach; go on a canopy ecotour; take salsa lessons; catch a show at Blue Chairs, dine at a white tablecloth restaurant; watch whales & dophins playing; eat your fill of fresh caught shrimp; buy handcrafted silver jewelry; listen to live music; watch the cathedral's dome and fireworks light up the sky from our patio; take a water taxi to a secluded beach; be serenaded by a mariachi band; take the public bus for 6.5 pesos (about 50 cents) to explore the other side of town; buy fresh tamales for tomorrow's breakfast from a street vendor; or browse the many artsy shops. 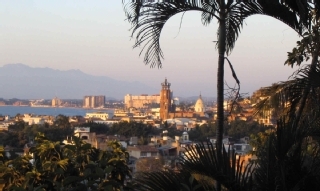 Or maybe you'd like to stroll down to the Plaza for the free night time live performances or stroll along the Malecon to take in the sites downtown. There's something for everyone here. Alegria is our home away from home and we are furnishing it for our comfort and that of our guests. Click on the photos link to see for yourself. In the living and sitting rooms, you will find gauzy drapes gently moving with the breezes off the Bay of Banderas and the Sierra Madre Mountains and comfortable chairs and sofas in leather and woven natural banana leaf fiber with cool cotton upholstery. Saltillo tile floors, stucco walls, arched doorways, Mexican handicrafts, and perotta wood detail throughout provide a distinctively Mexican feel. Shaw Satellite TV with hundreds of Canadian and US channels, high speed internet, local landline phone service, VoiP unlimited US and Canadian phone service, DVD/CD player, games, and books are provided. Alegria comfortably sleeps up to 6 persons. In each of the two bedrooms you will find custom made American size and quality pillow top mattresses, silky quilts, extra pillows, extra blankets and luxury linens for your sleeping comfort. In the master bedroom, there is a king bed. In the guest bedroom, there is a king bed which converts to 2 extra-long twin beds - just let us know how you want the room made up. The converted king is indistinguishable from a standard king. There is also a queen size murphy bed with the same quality mattress and linens in the sitting room off the patio. Pleasant breezes, ceiling fans, and cool dry evenings during winter months make for a restful night. Quiet mini-split air condioning is available but usually only needed during off season when the evenings are warm and humid. Charming and comfortable furnishings and drapes with a subdued tropical motif provide an inviting and private retreat at the end of a perfect day. You will find alarm clock radios, nature sound machines, and reading lights along with ample clothes storage in each of the bedrooms. Both baths have custom tile work, handpainted talavera sinks, and handcrafted tin mirrors for Mexican charm while deluxe INOX bath appointments including a dual head rain and Euro shower and thick towels provide a luxurious spa experience. In the master bath there is a hair dryer, toilet, double sink, and 2 person shower. In the guest bath there is a toilet, single sink, and single shower. Extra large pool/beach towels are also provided. The Mexican motif and thoroughly modern kitchen sports granite counter tops, custom tilework, double Franke stainless sinks, purified water spigot, full size stove, micro-wave, dishwasher, and refrigerator. It comes fully equipped with towels, hot pads, pots, pans, dishes, glasses, barware, cutlery, utensils, drip coffee maker, toaster, blender--even a stove top expresso maker. There is a free washer and dryer in the unit. Outdoor space is fully furnished with a roofed dining area, gas grill, tables, chairs, umbrella and lounging furniture for enjoying the private landscaped patio and balconies. We provide maid service 2 scheduled days per week. Extra days available at 300 pesos per day. There is an iron & ironing board and strong box in the unit for laptops, cameras, passports, etc. Bring your own padlock. We provide the following consumables: purified running water--no need for clumsy bottles, hand & body soap, dishwasher soap, dishwashing soap, toilet paper, paper towels, facial tissue, napkins, coffee filters, and laundry soap. This is a professionally managed property. 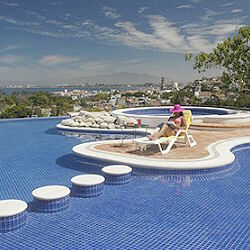 Alegria is perfect for couples or families. Well supervised children are welcome here and will enjoy the amenities as much as our grandchildren do. Sorry, no pets are permitted within the complex and smoking is permitted in outdoor public areas only, but not inside Alegria. 10% discount on booking 30 consecutive nights or more. 50% deposit is needed to reserve your dates. Balance plus $500 security deposit due 60 days prior to arrival. Payment accepted in US funds. E-mail today for more information. Tell us if you prefer an e-mail or phone reply.